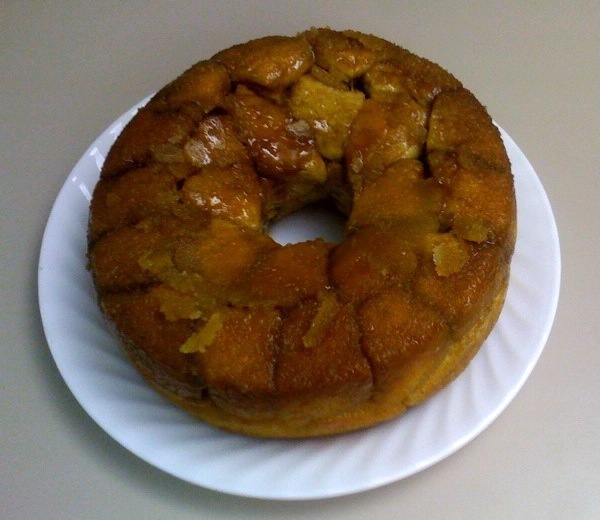 A week ago, I was aware of monkey bread but hadn’t eaten it or made it. Now, I’m ready to man the 1-800-MKY-BRED hotline! OK, that’s an exaggeration, but I did make two versions and have a few things to share with you about the recipes. This recipe is based on Art & Soul’s Old-Fashioned White Loaf bread dough. After the first rise, I cut the dough into cherry-sized pieces, dipped them in melted butter, and rolled them in cinnamon sugar. I put the balls into a pan for the second rise and then baking. The recipe says to make one batch of bread dough and bake it in a loaf pan. I made a double batch of dough and baked 24 mini monkey bread muffins, a 6″ round pan of monkey bread, and a 6″ round pan of plain white bread. Unfortunately, the muffin version was a flop. I probably overbaked them, but even if I hadn’t, I don’t think this is the way to go with this recipe. The 6″ version, which had two layers of the dough balls, was much better. The muffins had only one layer, many of them fell apart, and they were too crusty. Instead of bringing these to work, I tossed them in the trash. But the 6″ version was delicious. The plain white bread was delicious too; the perfect thing for a pb & j sandwich. The recipe for Old-Fashioned White Loaf starts on page 72 of the Art & Soul of Baking, or you can find it here on Google Books. Page 73 has the details for the Monkey Bread variation. This recipe skips the pesky details of making a yeast dough; instead it’s based on refrigerated biscuits (note that the exclamation point is part of the Grands! name; I’m not adding that to show my enthusiasm for them). I cut the biscuits into quarters, coated them with cinnamon sugar, arranged them in the pan, and doused the whole lot with a melted butter and brown sugar mixture. This is a quick iPhone photo, but you get the idea. This was quick to put together and I was able to bake it in the morning and take it straight to work. I served it at a team training session and it got a thumbs-up from the group. You can find the recipe here on the Pillsbury website. My husband and I are the only ones who tried both versions. First, let me say that both versions are really good. When I was trying to decide on a favorite, I thought hmmm…I like the homemade bread dough in version 1, but boy that butter and brown sugar mixture in version 2 sure is good. I asked my husband what he thought (without telling him what I was thinking) and he said he really liked the texture of version 1 but also liked the brown sugar mixture in version 2. As we all know, great minds think alike. 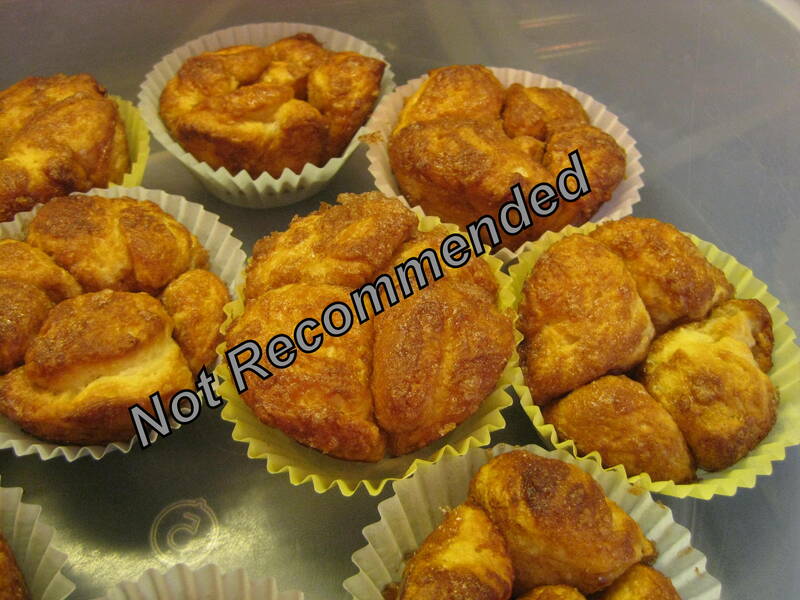 I need to get working on Monkey Bread version 3! Mmm! I think they first one looks awesome. We were in the same boat: totally aware of monkey bread, never made/ate it. I’m still (sadly) in that boat. Alone. But I now have the drive to make it!! Its a lot of bread so I’m thinking to bake it up for a party. Perfect finger food!!! I love the look of the top version – all that cinnamon and brown sugar sounds fabulous. 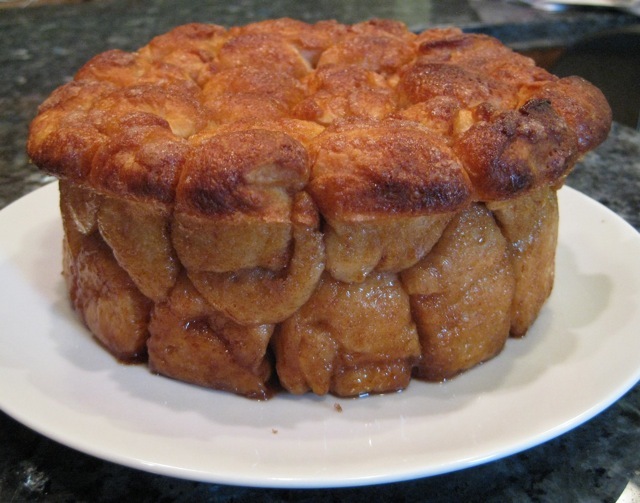 I LOVE the shape of both of them-I’ve seen many a recipe for Monkey Bread, but I have to admit, I’ve never tasted it! They both sound delicious-what an effort! LOL on the research…I am eagerly awaiting the results of Monkey Bread #3. I used frozen bread dough (thawed of course) and get good results, but again, it might be the cinnamon butter mixture that makes or breaks the deal. Both of yours look really great. I wish I was there for the taste testing! What an interesting post! I think both versions look really delicious and I love reading about your experimentation.